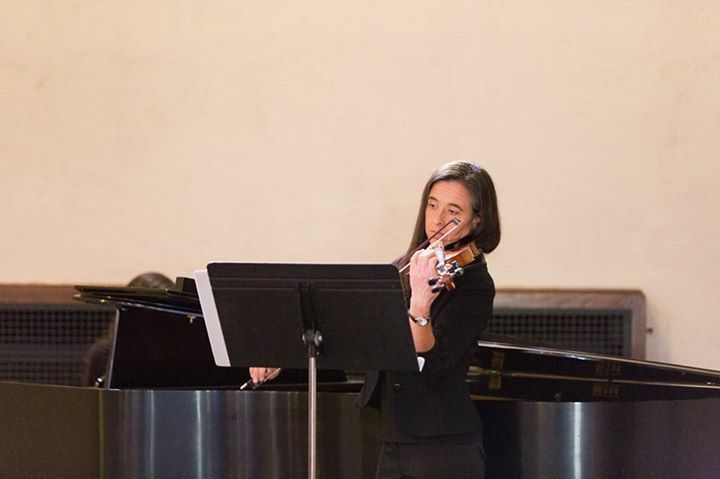 Alyssa on piano and Karen on violin at Union Congregational Church in Green Bay in November 2014. Such a lovely setting for a wonderful couple's wedding! We were able to play for the wedding of a friend. Congratulations! Rebekah and Karen played for this beautiful summer wedding (July 2013) at Stone Harbor Resort in Sturgeon Bay. We had a great time playing for this delightful couple! Karen and Rebekah playing at St. Joseph Catholic Church in Sturgeon Bay July 7, 2012. We also accompanied a choir on piano for this wedding. We played for a truly lovely wedding in the Scandinavian Gazebo at Green Bay Botanical Gardens on May 26, 2013. The weather was perfect and the setting was gorgeous! Congratulations Kirsten and Brady! Celebratory Strings offers music for special events. Karen and Alyssa Phillips specialize in music which is well-suited for weddings, teas, dinners and other special events. Our instrumentation works well for outdoor events and complements beautiful natural surroundings. The quality of the violin and piano is lovely in churches and chapels as well. Our music is ideal for providing a beautiful background for dinners, receptions or other special events as it adds an elegant touch without overpowering conversation. We are also happy to provide piano accompaniment for vocalists. Celebratory Strings is the Best! I can't say enough about Karen and Alyssa. They played so beautifully for my daughter's wedding this weekend. They were very professional and easy to work with. The music graced the wedding while guests were arriving until they left. Karen and Alyssa played the music we chose and their presence made the wedding so happy and elegant. I highly recommend them for your occasion/celebration! Karen and Alyssa far surpassed our expectations and wishes!! They were extremely professional, responsive, and accommodating during the planning and practice of our music, and blew everyone out of the water with their beautiful performance! Celebratory Strings worked very well with our cantor and organist, and even came to the rehearsal to practice with them. Excellent quality at a very affordable price! Thank you guys for making the music at our ceremony so beautiful; it will be something I will fondly remember! 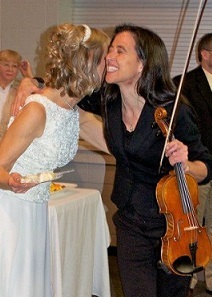 Karen and Alyssa (violin/piano duet) played for our wedding ceremony in January. Celebratory Strings came highly recommended from my cousin that used them at her wedding a few years prior. I would recommend them to anyone that is looking for a personalized touch on their ceremony. We had a full Catholic Mass and Karen & Alyssa were very accommodating by learning a new song and working with our cantor to ensure our day went smoothly. We had SO many compliments on the music and how beautiful it was. You won't go wrong choosing them! Karen was such a wonderful person to work with! She was open to learn new songs for the wedding and they sounded beautiful! She did not disappoint! Highly recommend! Celebratory Strings' music was beautiful. They were so professional throughout the entire ceremony and were very accommodating to our needs. Thank you! We loved playing for your wedding! We had Karen play for our wedding in Sept. She assisted us with choosing the perfect music. I gave her some music I liked and she would send me a sample of how it would sound, very helpful. The wedding music was wonderful and everything I hoped it would be and more. Thank you so much for making our day special. Karen recently played for our January wedding. She was a joy to work with and created such beautiful music. I would definitely recommend her for her warm personality, professionalism, talent....I could go on and on! We were so pleased with her services and heard numerous wonderful comments after the wedding! Thank you so much Karen!!! I found Celebratory Strings on GigSalad and they are awesome! They were everything we had hoped for in our ceremony and more! Such nice individuals who went out of their way to make sure our ceremony music was perfect. We had a session together where we chose our music, they also rehearsed with our church vocalist weeks before and attended our rehearsal the night before the wedding. We were complimented on our ceremony music by many of our guests. I would highly recommend Celebratory Strings to anyone! I am so glad I found Celebratory Strings on Gig Salad! Karen was awesome to work with. They have a great selection of music and we even found one that was very meaningful to my dad and me. Which really meant a lot to us. They are talented and wonderful musicians and exactly what I was looking for! I diffidently recommend them. Thank you Katie! Your wedding was lovely and we were so happy to be a part of it! :) I wish the two of you all the best! I found Celebratory Strings on Gig Salad and I am so grateful I did! They were better than I could have hoped for! Karen was amazing to work with and such a nice person. Celebratory Strings had a great selection of music and had just the right songs for exactly what I was looking for, they even learned a new song for me! They were the perfect musicians to use for my wedding ceremony, and exactly what I was looking for! I am so pleased with Celebratory Strings I will definitely use them again or refer people to them in the future. These women are not only amazing musicians, they are are also amazing people to work with. Their playing was beyond anything I could have hoped for. Even more than that, they were very easy to work with and did everything they could to cater to all of my requests. Karen runs a fantastic business and is very reasonable on her cost. I highly recommend hiring these wonderful women! You will not be disappointed... You will be so happy. EXCELLENT quality musicians and compassionate people! Karen and Alyssa did a WONDERFUL job playing at our ceremony. Throughout the entire process Karen was fast with communication. Karen and Alyssa met with us before the ceremony and learned new songs just for us. They also had a great list of songs to choose from. Karen chose to meet with our ceremony location on her own to feel more comfortable at the site which really demonstrated her professionalism. Karen also came to our rehearsal, without being asked, so that she knew exactly what to expect during our ceremony. Karen and Alyssa came to set up well in advance before our ceremony. I was a bit preoccupied during the ceremony, but I heard WONDERFUL feedback from our guests about the music. I have nothing but great things to say about Karen and her daughter. I would definitely recommend them to anyone and everyone!! We had Celebratory Strings perform at our wedding this past August. They were so amazing! First, we got a private concert of them playing songs so we could hand pick what we wanted. This was so special! It made us feel very secure that we picked the perfect accompaniment for our wedding. They helped us find songs that fit us well which was very helpful. Karen stayed in contact with us throughout the planning process. This was the best part because a lot of our other vendors, I had to contact them to try to get a response. With Celebratory Strings, Karen took the initiative to contact me just to check in and make sure things were still as planned. The ceremony was absolutely beautiful. They were prompt, professional, and the music was perfect. We will always remember this special part of our wedding. Thank you so much again! Thank you, Marie! It was such a lovely wedding and we were so happy to get to be a part of it. Celebratory Strings performed at our wedding ceremony. They are extremely professional and talented and went way above and beyond to help us plan our wedding music & ceremony and attended our rehearsal. I would highly recommend them for your event - they are great! Celebratory Strings is an awesome group of musicians. They played during my daughter's wedding reception cocktail hour, and the music was beautiful...tastefully chosen, professionally done, and at a very reasonable cost. I would not hesitate to recommend them. Thank you so much, Anne! We loved playing for your daughter's reception. It was truly a beautiful event. In planning for my niece's Wisconsin wedding, I thought a live classical performance would add a lot for the outdoor ceremony, so I began researching online and found Karen at celebratorystrings.com. I emailed them an overview of the event and the date and crossed my fingers. I had a response quickly. From the outset, communication was extremely clear and quick. Great for me as I am an "email person". Once the date was secure and I connected Karen and the bride, they took the ball and ran. They worked on custom music selections and even learned a new piece for us, sending us sample recordings as well via email, offering suggestions for various parts of the ceremony... I was very impressed. They showed up early to the rehearsal and endured heat and bees. Most importantly, they play beautifully. On the day of the ceremony, they were early and prepared and helpful throughout. They started playing well before people began to get seated, nailed all their cues during the ceremony and played through the entire receiving line. I couldn't have been more impressed. They were exactly what I wanted and did not disappoint in any way. Highly recommended! The Philip's are talented violinist's and beautiful. Karen and her daughter have performed at many of our Elegant Luncheons and Fashion Shows in the past 8 years. Attendee's love the soft beautiful music during Hospitality Hour and Dinner. Celebratory Strings: A Beautiful Part of a Special Day! Fantastic music for my wedding! Celebratory Strings played for my wedding and did an amazing job. They are professional, thorough and fabulous musicians. They were very open to any ideas I had and made the ceremony personal and beautiful. Would highly recommend! Celebratory Strings works well for outdoor settings and in churches or chapels. When we are playing for a wedding, we typically begin music 20 minutes to a half hour before the service as the guests arrive, providing an interesting element for them to enjoy as they wait for the service. We also play as guests are filing out after the service until the room has cleared, providing a musical finishing touch for your service. Celebratory Strings has been providing music for weddings, dinners and teas in the Green Bay area for the past 13 years. When we play for weddings, we always offer a complimentary session to meet with the bride so she can listen to and choose music for the processional, recessional and any special ceremony music. Our goal is to provide music that is beautiful and unique for your event. If there is no piano available at your venue, we are able to provide our performance keyboard for your event. Although it usually isn't necessary, we have amplification equipment for both the violin and piano if that is necessary for your setting. Our violin duo, flute/violin duo and violin/violin/flute ensemble plays classical music or celtic music. We also arrange pop music for our ensemble by request. In addition, we provide classical or jazz solo piano and piano accompaniment for vocalists. We are classically trained, and classical music is our first love, but we truly enjoy and appreciate all types of music. Because if this, we are thrilled when a client requests a song that has special meaning to them which we are able to arrange for our ensemble and perform for their event. Your wonderful engaging personality toward my Open House guests and my staff blended well with your awesome & almost never stopping professional and artistic performance on the violin. Thank you for helping make our Open House memorable.